Welcome to another great spotlight post my bookish friends! 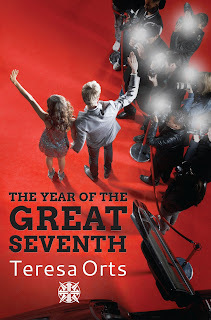 When I first saw Teresa Orts' The Year of the Great Seventh, I knew I'd want to read it. All about celebrities, and the lavish lifestyle of well-to-do LA teens, I couldn't wait to dive in. Just check out the synopsis! Sophie has always felt out of step — an outsider, even amongst friends in her high school with all the hype about celebrity culture. Her life in L.A. seems to have been already written for her, but when her junior year starts, it all takes a drastic turn. When she crosses paths with the school's heartthrob, Nate Werner, they fall for each other in a way neither can understand. What they don’t know is that by giving in to their desires, they are unlocking an ancient Egyptian prophecy that threatens to return Earth to the dark ages. To further tempt you, here's an excerpt. 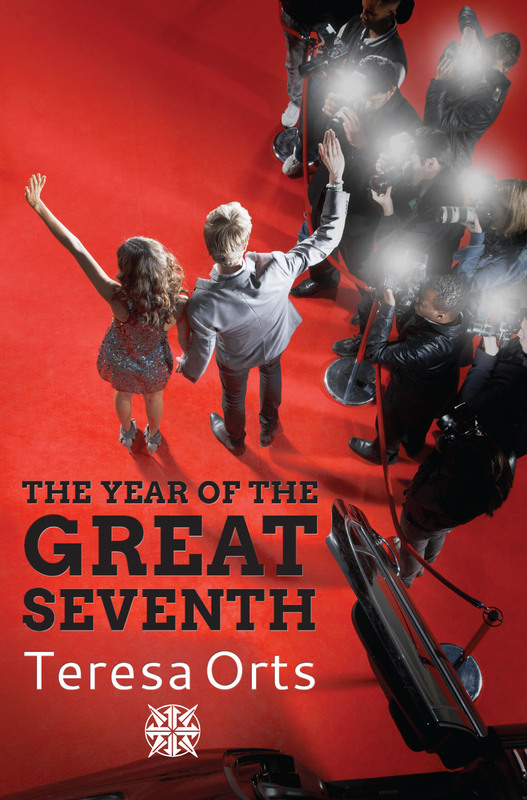 Enjoy, and don't forget to add The Year of the Great Seventh to your reading list! Admitting I wasn’t going to fall asleep, I emerged from under the bed covers, went over to the windows, and sat on the floor. They say if you can’t beat ‘em, join ‘em. Well, if the city lights were going to keep me awake, I might as well enjoy the view. Crossing my legs in the lotus position, I admired the city skyline. The other glass tower across from us seemed to be private apartments. Most of the floors had their lights on. The energy of this city was captivating. Life continued on through the night in the city that never slept. It was starting to snow. The frosty flakes resembled white cotton candy. They seemed to be defying the laws of gravity as they were suspended on the air and then swirled up into the sky. It was probably due to the air current caused by the tall buildings. But as things stood in my life at the moment, anything seemed possible. The traffic was as dense as rush hour in downtown L.A. Cars jammed around Columbus Circle, and no one thought twice about leaning on the horn, even though it was past midnight. In one of the apartments opposite, a man was sitting by the window, typing on a laptop. The room was dark, but the reflection of the computer screen lit up his face. I could see him clearly. It was as though we were sitting across from each other. I was sure he could see me, too. We were so close, but at the same time, so far. This must be the big city syndrome where you can feel so alone amongst so many people. And knowing that Nate was just across the wall only enhanced the feeling. I had to start blocking any thoughts of Nate. I had to give myself a break or I was going to start losing my mind. Unfortunately, I was aware that ignoring a problem wasn’t likely to make it go away. I couldn’t believe Nate had planned to hide the stain on his back from me. How long did he think he could pretend everything was going to be fine? Dad taught me to only believe what could be proved by science, but this lulled me into a state of denial. Nate was vanishing with the tick of the clock, and I had to help him. I wasn’t sure how yet, but I couldn’t fail him. I wanted to slap myself to throw myself into action. How could I be so passive when I was losing the only thing I wanted? The man in the apartment across from me was drinking from a cup and flicking through the pages of a book that he had next to the laptop. After scanning a few more pages, he continued to type. I wondered what he was doing. I wanted to think he was writing a detective novel based in 1950s Manhattan. The man stopped typing and stared openly at me, as if he also needed to share his secrets with a stranger. It was snowing hard, and thousands of snowflakes playfully spiraled up into the sky, proving reality had many dimensions. The simple stare from a distant stranger was appeasing that loneliness that was taking hold of me. I couldn’t stop staring back. Here, sitting on the floor of this grandiose room, in the epicenter of the madness of this city, I just felt so small. How was I, this tiny, fragile girl, going to make the world change its course? The man went back to typing on his computer, unconscious that with just one stare he’d provided me with the courage I lacked. I was beginning to fall in love, but in this case, with New York City. There was something about the anonymity of this city that brought us closer as humans.